We are dedicated to lifelong learning and continually expanding our therapeutic options with the latest veterinary technology and expertise. After graduating from the Ontario Veterinary College, Guelph in 1997, Dr Gray founded Blue Mountain Veterinary Services in April 1999. Dr. Gray enjoys the interaction with her clients and their four-legged families, and has a special interest in Regenerative Medicine. She is a lifetime horsewoman, raised here in the beautiful Beaver Valley on her family’s farm. When she’s not working or riding, she is an enthusiastic gardener. She lives on the 100 acres that the clinic calls home, with her warm blood Charlotte and a small, but vocal, army of chickens. Dr. Vasile Dzsurdza brings with him over 20 years’ experience in orthopedic and soft tissue surgery. He has spent many years practicing emergency medicine at an emergency hospital in Oakville. Dr.”D.” is excited to fish the Beaver River! Dr. Jennifer Woodhouse graduated from the Ontario Veterinary College in 1992. She lives on a farm with her husband Randy and their four girls Hannah, Abby, Bethany and Charlotte. Together they milk 48 dairy cows, have 100 sheep, many chickens and a horse. There is nothing Jen loves more than to spend time with her family. Dr. Evelyn Muma graduated from the Western College of Veterinary Medicine. 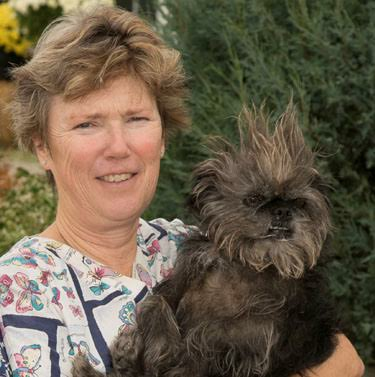 Born and raised in Saskatchewan, Evelyn and her husband Robin have made a giant leap across Canada and now live in Wasaga Beach with their cat Oscar, and ferret Zorro. While Evelyn enjoys working with dogs and cats, she also has a keen interest in exotic animal medicine. In her spare time Evelyn loves spending time with family, going for hikes and walking along the beach. Evelyn is very excited to be part of the Blue Mountain Veterinary team. Angela has returned to us after working many years at Bellbrae Animal Hospital. Angela was with us in our early days and she is excited to be back. She has two 2 legged children (Cameron and Sophia), and three four legged (Hunter, Ronix and Holstein). She spends her free time skiing/snowboarding in the winter and hiking with her family on nice days. Shelby recently moved back to her home in Grey Bruce after 5 years of working in Niagara Falls. Shelby graduated from Georgian College in 2012. Shelby and her boyfriend Gordon happily share their home with their cat BC, dogs Kasha an English Mastiff and Lady an Australian Cattle Dog. They are also the proud owners of 2 horses Dudley and Cola. Shelby is very excited to be joining the wonderful family at BMVS. Kelsey was born and raised in the small town of Harriston. She graduated from the Veterinary Technician course at Georgian College in Orillia in 2015. She is currently living in Meaford with her fiance Trevor, their Chocolate Lab Tucker, Long Haired Dachshund Piper and kitties Domino and Roro. Kelsey loves baseball, baking and spending time at the family cottage in Southampton. Melissa grew up in Clarksburg around the corner from BMVS on her Family's sheep farm. She graduated from the Veterinary Technician Program at the University of Guelph Ridgetown campus in 2016. In addition to many sheep she also has a corgi named Kai. In her spare time Melissa enjoys gardening and spending time with her nieces. Debbie joined BMVS in September 2008, bringing her special brand of fun and fashion to the clinic. Debbie is a true “people person”, is very creative, and loves being outside gardening. In addition to her daughter, she has a new love – her grey mare, Apple! At home, the Smith family includes a bouncy Boxer named Luc. Kim has joined the BMVS team after being a client since 2012. She is nestled in the beautiful town of Eugenia, famous for the Eugenia waterfall, lake, and kilometers of trails in the heart of Beaver Valley. In her spare time, Kim enjoys kayaking down the Beaver River, hiking the beaver trails, and boating at the lake with her husband and red two year old Border collie Felix. She spends her free time competing and training in dressage with her 12 year old pinto-horse Dalton. Kim also enjoys spending time with her 11 year old calico cat named Harley. Kim is very excited to be a part of the BMVS family. dock diving, disc and Super dogs shows. They have multiple titles and have been Canada’s Elite Champions 2 years in a row. Ashley’s passion is canine rehabilitation, conditioning, and canine massage therapy. Melanie is a local who calls the nearby community of Thornbury her home. She grew up in the Blue Mountains Area, learning to ski when she was quite young. She shares her home with her husband, Harold, and her golden retriever Jasper. She enjoys walking the nearby trails at the waterfront and skiing. Mary joined BMVS in 2001, as a professional groomer. Her leisure time is spent with her daughter and husband, and they are famous for their terrific collection of classic cars. At home, the Begy clan includes two cats (Ethel & Etta), a Collie mix named Brock, two Pekingese mixes Dodger and Daisy, several hens and a rooster too! Lisa enjoys helping animals and working with them anyway she can. Grooming is Lisa’s favorite way to connect with pets. She spends her free time with her daughter Sierra and husband Brandon. They enjoy camping together. Lisa has a horse, Onyx. She also has two dogs, Buddy a Husky Shepherd mix and Tinkerbell a lab mix. James graduated from Northern College with a diploma in Animal Grooming. He and his wife adopted a greyhound named Cricket in 2012 and have since been fostering retired racing greyhounds. James and his wife share their home with several cats as well. As an accomplished groomer James adds a valuable service to our team. Hannah is an animal lover just like her mother, Dr. Jennifer Woodhouse. She lives on her family dairy farm in Heathcote and enjoys spending time with her farm animals as well as participating in 4-H livestock clubs. Hannah attends the University of Guelph and is working towards a degree in Biomedical Sciences while also participating on the varsity Cross Country and Track teams as an avid runner. She’s very excited to be part of the BMVS team! Mikayla has joined BMVS as a Kennel Attendant. She lives at home and enjoys spending time with her Australian Shepherd Sadie and Darby a Golden Retriever White Shepherd cross. Mikayla also loves riding her horses Roxy and Dakota. In the summer Mikayla enjoys activities such as 4-h, soccer, team penning, baseball tournaments and the odd rodeo. In the winter she volunteers at Can- Skate Saturday mornings and snowboards whenever she can. Handsome Slipper has been our Resident Clinic Cat since February 2010. He is a Domestic Longhair with an unusual taupe color and possible ADHD tendencies. His interests include sleeping on the magazines, greeting clients and intimidating their dogs, and freestyle typing on the reception computers. He has yet to set up his Face book account, but we are sure he will have lots of ‘friends’. Please do not give him your credit card, no matter how hard he begs.